Supergirl finishes for the winter hiatus with the emergence and first confrontation with the season’s main antagonist. Waiting until now to properly begin Sam’s villain story is a great idea as it allowed the character to be developed gradually over the past few episodes. She has very quickly become an important part of the show who believably contributes to the character base. 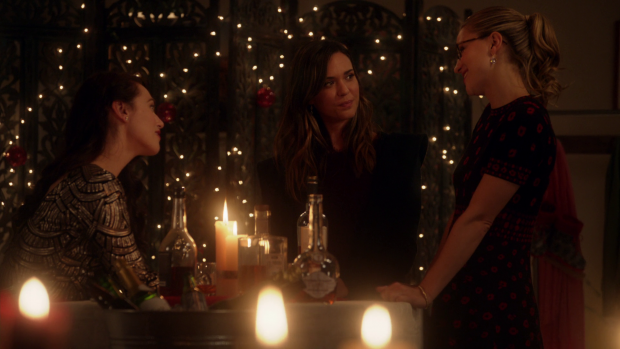 Adding her to the Kara/Lena dynamic to make a charming trio of friends has worked really well because the three actors have such great chemistry together. Hinting that there is something else happening to Sam throughout adds an air of tragedy to this as it’s clear that it can’t last forever. Sam’s relationship with Ruby was another great decision. Adding a daughter to the mix gives her something significant to lose and creates effective tension during every scene they spend together thanks to the knowledge that something dangerous is happening to Sam. Ruby is in constant danger but doesn’t know it and the beauty of it is that Sam doesn’t really know that either. It’s clear she wouldn’t willingly do anything to harm Ruby so there will likely be some internal conflict over the course of the season. The previous non crossover episode featured Sam taking significant steps forward in her transition. She learned where she comes from and the purpose of her creation. It seems that any element of choice has been removed from what happens to her which adds to the tragedy. We know that Sam isn’t a bad person and this episode spends some time establishing that she is in some sort of trance when she becomes Reign. This episode spends a lot of time reminding us of everything Sam has to lose in her civilian life. An early scene reinforces her friendship with Kara and Lena, there’s a really sweet interaction with Ruby that shows how much Sam cares about her and reminders of how hard she works in her career also exist. It’s almost a whistle-stop tour of everything that makes up Sam which greatly adds to the tension associated with her transformation. Reign’s presence in the episode plays out like a mystery showing that the writers aren’t interested in pandering to the fact that Odette Annable’s role in the show has been well reported in the media. It starts with a mysterious symbol appearing all over National City which perplexes even the Alura AI. She identifies it as ancient Kryptonian but can’t give much more detail than that. Kara is faced with something native to her culture that she knows nothing about and, whether she’s prepared to admit it or not, it scares her though her fear manifests as determination to solve the problem. It’s good to see Kara being so proactive rather than her usual reactive though her reasoning for acting this way isn’t as pure as she would like it to be though more on that later. A few theories about the symbols are thrown around with Morgan Edge being the clear favourite to be behind it. Kara gets some real information on it when she speaks to Thomas Coville from back in “The Faithful” who knows all about it for some reason. 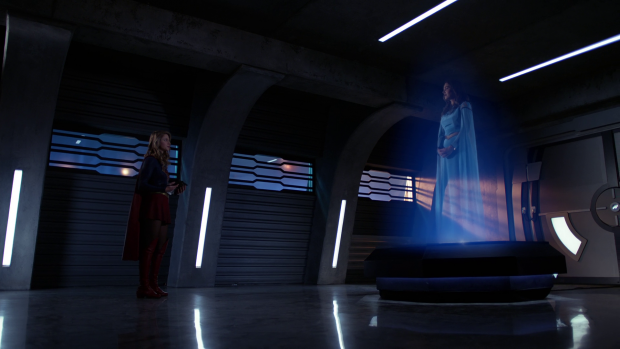 It’s a bit of a stretch that a human who worships Rao through Supergirl would know more than the Alura AI but it adds depth to the season by making the Supergirl worshipping religion feel like something more than a one shot deal. It also gets the plot moving very quickly and keeps the pacing constant. Reign is characterised as a dark version of Supergirl which seems boring since we had that just last week though it’s very different to an alternate universe Nazi duplicate. The darkness comes from the fact that her mission statement seems similar enough to Kara’s but her methods are very different. This means that she still goes after criminals and bad people but she kills them instead of turning them over to the authorities. At this point Reign represents what Supergirl could be if not tied down by her morality. It’s interesting to contemplate and enhances the similarities between the two characters. I appreciated that the episode didn’t go down the route of the public immediately turning on Supergirl. Morgan Edge tried to point the narrative in that direction but this is a public who are used to alien attacks so a similar power set isn’t enough to change the prevailing opinion. People aren’t willing to believe that Supergirl would suddenly start acting like this so Kara doesn’t have to worry about reputational damage as a problem that needs solved. The drama comes from a sense of responsibility that Kara feels. Reign is a product of her people so it’s difficult for her not to feel like it’s up to her to solve the problem. As a hero she would do that anyway but there’s additional heft to her involvement since she has to once again protect her adopted planet from a problem that came from hers. All of this is in the subtext though is clearly being set up to be developed over the course of the season. The main focus of this episode was to establish Reign as a credible threat and build up to their first confrontation. It’s a brutal action sequence that never becomes boring thanks to the emotional stakes as well as the constant changes in location. Reign is completely uncompromising and completely outclasses Kara in every way. Alex’s pep talk prior to the confrontation where she encourages Kara to embrace her cold Kryptonian side over the compassionate human side sets up Kara’s mindset for the battle showing that she isn’t distracted by her desire not to harm her opponent. Reign can definitely take Kara at her best so there are no problems with Kara needing to hold back in any way. Knowing this makes it all the more significant that Reign defeats her so definitively. Having the fight be as long as it was is important as it shows how capable Kara is. She doesn’t make it easy for Reign nor does Reign’s victory seem simple. The fight was hard fought on both sides but Reign ultimately proved to be the better combatant. In many ways it reminded me of the fight in The Flash episode “Enter Zoom” as both fights show a hero outclassed by a foe like nothing they have ever fought before. 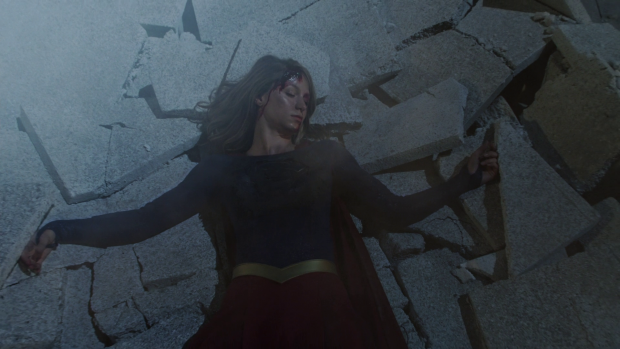 Seeing Kara become progressively more injured as the fight goes on is very distressing and ending it with her being in a coma ups the ante for when they next battle each other. It also establishes that Kara is going to have to find another way to defeat Reign as brute strength isn’t going to get the job done. The fanboy in me would like Superman to be involved or perhaps another crossover but I know that’s unlikely. Outside of the main story the episode is a little too bogged down in romantic drama. As predicted James and Lena are beginning to give into their mutual attraction which does more or less work though I can’t really see it progressing in a way that is either unique or interesting. For the moment they are simply pretty people who have chemistry acting on that chemistry. There doesn’t need to be any more than that for now but I sense that angst is coming. The Kara/Mon’El/Imra love triangle is well acted by all three actors but also comes across as somewhat repetitive. Kara is upset that Winn has a new wife and no longer has any love in his eyes, Mon’El clearly feels bad for hurting Kara by having his wife around and Imra feels bad for Kara because she knows that it must be difficult. In fairness she does try to deal with the situation and reassures Kara that Mon’El’s feelings for her were real but he eventually accepted that he would never see her again. It doesn’t improve the situation but it’s a small character beat that establishes Imra as an empathetic person who isn’t around to hurt anyone. I was far more interested in the dialogue establishing that the Legion of Superheroes are a thing that exists and that Mon’El founded them to continue Kara’s legacy. It’s similar to the comics where the Legion were inspired by Superman and shows that Kara’s efforts do ripple throughout history to the point that they really matter. It’s a hopeful message for a show that focuses on giving hopeful messages and makes sense in context. One thing I did wonder was how much Mon’El and Imra know about the immediate future. It isn’t something that comes up throughout the episode and I’m surprised that nobody asked the question given what was going on. I suspect this is something that will come up once the show returns from hiatus as having characters from the future around very much demands that the possibility of gaining knowledge that can help be addressed. It could be that Mon’El and Imra are being very careful not to be involved which might be another explanation for them keeping to themselves and focusing on fixing their ship though focus is given to the emotional awkwardness. Despite the really dark story and emotional angst there are moments of levity throughout such as a really well put together Christmas party scene at Kara’s apartment. The comedy is on point such as M’yrnn ecstatic over his love of the other brown water otherwise known as cocoa, J’Onn loving Hall and Oats as well as Star Wars and Ruby’s fangirling over Alex’s proximity to Supergirl. Scenes like this often make an episode of Supergirl as the characters are always so engaging to watch interacting with one another. Another extraneous subplot was Lena’s rivalry with Morgan Edge. As villains go Edge isn’t all that engaging and antagonistic relationship he has with Lena doesn’t really work for a variety of reasons but the biggest issue is that Lena is well written and nuanced where Edge is a poorly written cartoon character. This episode proves that with a laser gun wielding assassin apparently hired to kill Lena plot that goes pretty much nowhere and adds nothing to the dynamic between them other than Edge barely denying it. An engaging if flawed midseason finale that ramps up the tension in the villain story significantly. Sam’s transformation into Reign has been fascinating so far and this episode shows just how formidable she is as a physical presence with lots of potential for Sam’s better nature to conflict with her programming as Reign. 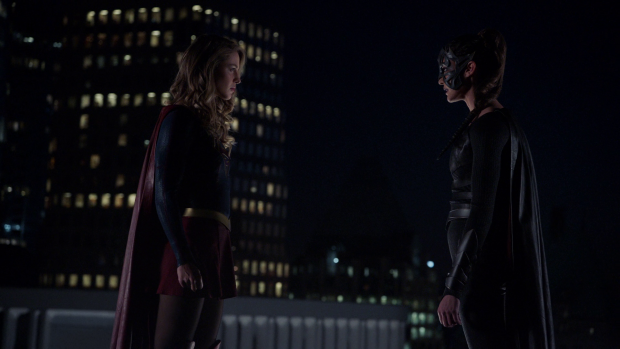 The confrontation is really well choreographed and brutal to watch with a shocking ending for Kara. Outside of that the episode seems somewhat preoccupied with romantic drama coming from James and Lena as well as the Kara/Mon’El/Imra love triangle. None of these plots are bad but they’re also not terribly interesting either and come across as repetitive in the case of the love triangle. 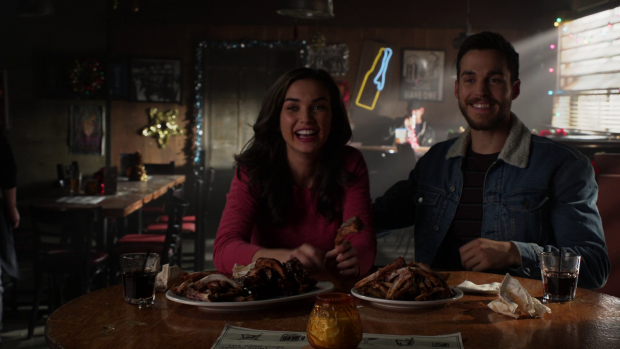 Despite the dark story and emotional angst there are moments of levity such as Kara’s charming Christmas party that really leans on the comedy and lets the rapport between the cast do the heavy lifting.